Bayern Munich will found a sixth football school in Asia after agreeing a youth development partnership with the Singapore Sports Council (SportSG), the Bundesliga giants announced on Monday. 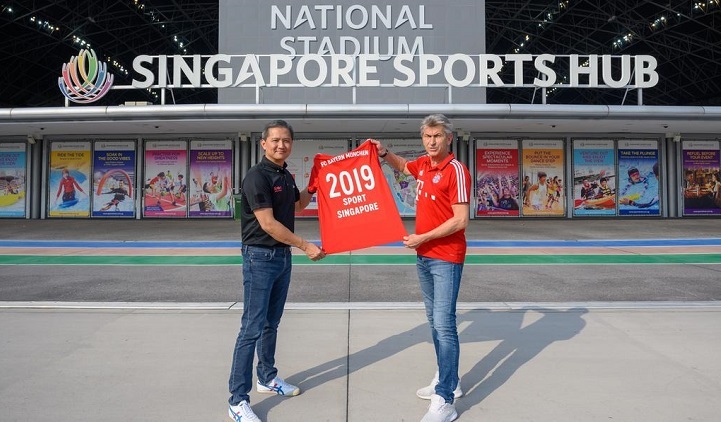 Former Bayern player Klaus Augenthaler was present at a signing ceremony at Singapore's Jurong East Stadium on Sunday, as the club pledged to "close future co-operation" with SportSG, the government agency in charge of sport. The partnership will involve education programmes, coaching exchanges and participation in the international youth series, "FC Bayern Youth Cup", the club said in a statement. "Football is becoming ever more popular in Singapore and we are proud to be able to work with SportSG," said Joerg Wacker, Bayern's Head of Internationalisation and Strategy. "In the centre of this partnership are a wide-reaching exchange of expertise and our ongoing support of the development of youth football in Singapore." SportSG CEO Lim Teck Yin said there was a lot to be learned from Bayern. "Their expertise will definitely help to inspire upcoming talents, encourage more players to train seriously and I hope that we will see sustained and increased interest in the sport over the years," he said. The partnership in Singapore is the sixth such initiative that Bayern have started in Asia, with further programmes in Japan, Thailand and China.